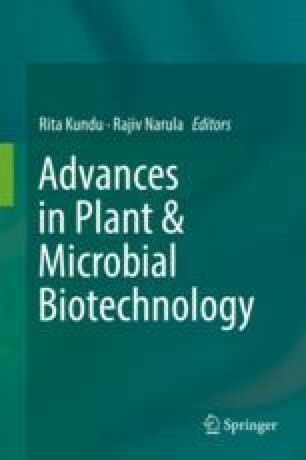 The present study laid emphasis on rice crop improvement by development of low-cost blue-green algal biofertilizer comprising of consortium of four ARM blue-green algal strains, viz. Anabaena variabilis (ARM 441), Nostoc muscorum (ARM 442), Tolypothrix tenuis (ARM 443) and Aulosira fertilissima (ARM 444) using different carrier materials, i.e. fly ash (100%), soil (100%), montmorillonite (100%), fly ash + soil (1:1) and fly ash + montmorillonite (1:1). Pot trial was conducted to study their effect on rice cultivar PUSA 1121 using nonsterile soil with a control without inoculation of blue-green algal consortium. At the time of harvest (after 90 days of inoculation), consortium of ARM culture showed highest nitrogen content (0.149%) and carbon (0.39%), respectively, at treatment T3 involving fly ash + soil (1:1) followed by highest grain yield (g per pot) of 14.3 and 12.75 which was recorded in treatment T3, fly ash + soil (1:1) as compared to control. Therefore in the present study, fly ash with combination of soil (1:1) was observed as a good carrier material in place of soil or MMT alone for showing highest nitrogen, carbon and phosphorus content promoting cheap and adaptable method by farmers for organic farming.